When I started documenting Merapi 2010 during my short time as volunteer in Yogyakarta, I told myself that I will document hope, not despair. But my mood tonight made me decide to post this sanctuary of father Sandjaja. He was a local martyr who was killed during the second Dutch military agression to Semarang and Yogyakakrta in December 1948. By the Catholic Church he was crowned a Beato. 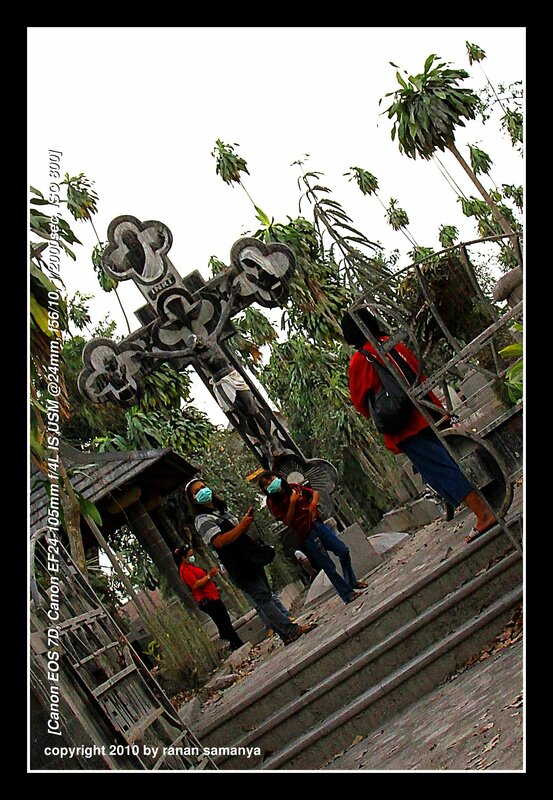 The sanctuary lies in Muntilan, 1 hour from Yogyakarta. Muntilan is one of the few districts that is badly hit by the eruption. I take it that those people visiting the sanctuary was praying for hope and forgiveness. This frame was taken from a car running at around 60km/hr. I increased the saturation a lot, as it was too grey under a grey day, too much sorrow.